Tours depart at 9.00, 9.30, and 15.00 daily from March to October. We are comparing Self-Drive Vintage Fiat 500 Tour from Florence Prices from leading ticket suppliers and Try to find you Cheap tickets prices on the market. This is a unique 4-hour driving experience taking you away from the traffic of Florence and onto quiet country roads. You'll get the chance to drive a Classic Fiat 500 through the Chianti wine lands and on part of the famous Mille Miglia rally route. You will meet with your friendly local guide just outside of Central Florence where you will receive a briefing and practice driving session, before following your guide into the rolling hills. You will be connected to your guide by radio at all times. During the tour you can see some of Tuscany's many vineyards and rustic villages, pay a visit to a terracotta factory, shop in independent artisan stores, grab an espresso or simply admire the scenery. You will also have an optional stop for lunch and wine at a Tuscan farmhouse. This is an ideal tour for friends and family, offering the security of a group tour but privacy within your own vehicle. For lovers of classic cars, for food and wine enthusiasts and for people who want to see that Tuscan countryside with the ease of an organised tour. This tour is much more fun than your standard bus tour as you will have a more personal experience driving through the Tuscan hills. Your Experience With Self-Drive Vintage Fiat 500 Tour from Florence? Get ‘off the beaten track' and discover the gems of the Tuscan countryside. Discover vineyards, rural villages, a terracotta factory, and enjoy a typical Tuscan lunch with local wines. (if specified). 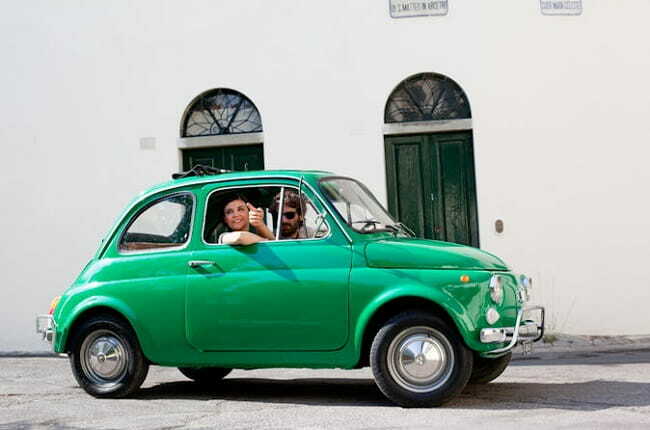 What Self-Drive Vintage Fiat 500 Tour from Florence Includes? Rental of Classic Fiat 500, including taxes, insurance and gas. Expert English speaking guide and 2 way radio to communicate while driving. If you're not a confident driver, or you are unfamiliar with manual transition, then arrive a little early for extra time to practice driving the car. During the busy season you should book the Fiat 500 tour in advance. Travelers Reviews about Self-Drive Vintage Fiat 500 Tour from Florence? Travellers love this 4-hour day trip from Florence. On Get Your Guide the tour has an average 4.8 out of 5-star score. On Viator it has a full 5-stars. Likewise, on TripAdvisor the tour has 5 out of 5 from customer reviews. Travellers agree that this is a fantastic day trip, a lot of fun and well organised. Tickets accepted in electronic or printed form. Tickets are refundable up to 7 days before departure date. Meeting point is 10 minutes from Central Florence by taxi or 25 minutes by public transport. Children aged under 2 are not permitted. Drivers must be at least 18 years old, know how to drive a manual car and hold an international/EU driving licence which has been valid for at least 1 year. Credit card in needed to prepare insurance documents. Up to 3 adult or 2 adults and 2 children are permitted in each vehicle.